When some of my friends told me they preferred Applebee’s over Chili’s, I froze. I remember thinking to myself, “How could anybody in their right mind think Applebee’s is good?” To me, Applebee’s had always been that one restaurant that nobody truly liked. I’ve actually bonded with people over our mutual distaste for the restaurant. Sadly, visiting both Chili’s and Applebee’s recently has only confirmed my deeply held beliefs. Let it be known that I am no food critic. I usually enjoy meals with my heart, not my head. That being said, I knew even from the appetizers that my experience at Applebee’s would be the inferior meal. The chips were very brittle, usually falling apart after one bite. For my entree, I chose to sample three different appetizers: mozzarella sticks, pretzel bites, and spinach & artichoke dip. There was very little I enjoyed about this meal, as most of it tasted like it was covered in grease. Chili’s, on the other hand, was delicious as usual. I enjoyed delicious chips and guacamole, along with a burger and fries. To my surprise, any of their burgers could be ordered with a black bean patty, making Chili’s the obvious choice for vegetarians. It’s easy to complain about bad food, but I find it very difficult to find what makes good food good. Chili’s food is good. I don’t have any fancy adjectives or metaphors to explain how much I like the food. At the end of the day, Chili’s will always come out on top in my book. I have some family in Lubbock, Texas who would occasionally take me to Applebee’s when we visited but otherwise I would never step foot in an Applebee’s or even consider it an option. Perhaps, it is because of all the rants in the Princess Diaries book series against the chain that I read growing up. But, I mean, Chili’s is everywhere and so delicious. I am obsessed with flatbreads, so naturally, I ordered the Margherita flatbread. I wasn’t a fan of the Garlic sauce on it, but it was a matter of taste and not a reflection of quality. I still enjoyed it as an entree and later as delicious leftovers. At Applebee’s, my only option other than the appetizer platter being vegetarian was tomato soup and grilled cheese. The bread and cheese on the grilled cheese was average; I felt that I could have made better in my dorm room. I didn’t choose to take my leftovers home. We ordered appetizers of chips and salsa and the molten lava chocolate cake at both restaurants and they were both equally good. Chili’s has so many great memories that it probably isn’t fair to compare atmosphere, but the music and lighting is energizing whereas Applebee’s seemed like an old person locale. Although, the new computers on the tables are distracting, but it did making paying easier, and I love an emailed receipt. All that being said, I’m still a Chili’s girl! Back home in Olathe, Applebee’s is just kind of the place to be. After church, events, and football games, it seems like almost everyone wants to meet up there to grab appetizers and hang out. That being said, I think that I have been converted by the Chili’s crowd. In critique of their atmosphere, I thought that Chili’s had nice lighting and a good vibe to it whereas Applebee’s seemed rather dim and depressing in nature. The waiters and waitresses at both restaurants were very helpful and attentive. They kept our thirsty party well supplied with various beverages. To start our meal off, we had chips and salsa at both restaurants. I personally preferred the light crispy chips at Chili’s to Applebee’s thicker offerings. I also preferred Chili’s salsa to Applebee’s salsa, but then again these are strictly my personal tastes. At Chili’s I ordered a delicious Turkey sandwich that was very filling for the relatively cheap price. It was very good. At Applebee’s I had a basket of chicken tenders that was kind of average, but you get what you order. I’m kind of a sucker for chocolate, so I was really excited for the molten lava cake that we tried at both locations. I found that the Chili’s cake seemed more moist and delicious, however you can’t really go wrong with fudge filled chocolate cake topped with ice cream. Overall, I was surprised to find that I really did prefer Chili’s to Applebee’s. I went into this little endeavor with no real opinion either way and came out with a preference. I think that in and of itself says a lot about the quality of service and food offered at Chili’s. For most of my life I have been going to Applebee’s; in fact, I hadn’t ever been to a Chili’s until my senior year of high school. I have to admit, the Chili’s 2 for $20 is pretty great, however, overall Applebee’s blows Chili’s out of the water. At Applebee’s there is a 2 for $20 deal as well, and it has very similar options to Chili’s 2 for $20 meals. My favorite deal at Applebee’s is their half price apps! After 10 p.m., you can go into Applebee’s and order as many appetizers as you want for half the normal price. After almost every high school football game, my friends and I would spend the evening enjoying Applebee’s amazing apps! 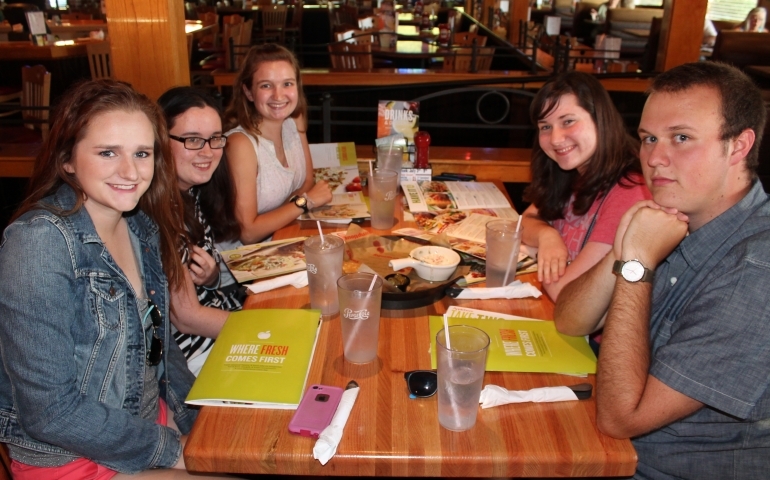 Overall, when our staff went to both Applebee’s and Chili’s, I enjoyed Applebee’s more. When we went to Chili’s, our waitress was very aloof and would forget about us at times. Their restaurant itself was very nice. It had a good atmosphere and was very clean. Applebee’s atmosphere was about the same. So it all comes down to the food. At Chili’s the food was very good, but I think Applebee’s was better. I ordered a salad at both places, and Applebee’s seemed to be more fresh. We had dessert at both places, and I will give it to Chili’s, their molten lava cake was on point! It was warm, and very chocolatey. In the end, I think a large part of the debate is familiarity. I will forever be a fan of Applebee’s. I have too many good memories there for me not to love it! I’ve only been to Applebee’s three times in my life. One of those times was with The Echo staff. However, I’ve been to Chili’s many times. It was a matter of familiarity to me when I walked into Chili’s and ordered the same entree I always do, the Big Mouth Bites. For those who don’t know, Big Mouth Bites are mini burgers that come with a side of onion rings and french fries. I thought the food at Chili’s was delicious, of course. I don’t think that the appetizers were that different between the two restaurants. I’d give the appetizer to contest to Chili’s simply because Grace mixed the salsa with ranch and let me tell you, that dip was delicious. I tried to go into Applebee’s with as open a mind as I could muster, despite the obvious bias of some of my fellow staff members. Since I’d ordered a burger at Chili’s, I decided to order a burger at Applebee’s, so I could compare the two more fairly. To my disappointment, the burger I had at Applebee’s tasted rather bland, whereas the Chili’s burger bites had been juicy and full of flavor. The desserts, however, were equally delicious between the two restaurants. Overall, I have to give the contest to Chili’s. Applebee’s wasn’t necessarily bad, but in my opinion, it failed to match up to Chili’s. The great debates like Coke vs. Pepsi or Triscuits vs. Wheat Thins are wonderful to start a new friendship. I knew you were a smart group of people when I first met you, but this confirms it for me. Applebee’s is the place you go when your only other option is mystery meat from a street vendor who has a truck full of cats.